Heat up chicken stock and gently stir in the miso until it is mixed in. Taste and add more miso if needed. Bring a pot of water to boil for the eggs. Gently lower them into the boiling water and cook for 6 minutes. Remove from the water and run them under cold tap water until they are cool to the touch. Peel and slice in half. Heat the butter over medium heat and add the corn. Stir to coat each kernel of corn in butter. Set aside. Blanch the wakame in boiling water and remove from the water and set aside. Cook the ramen noodles according to the package, drain and place in the bottom of two large bowls. 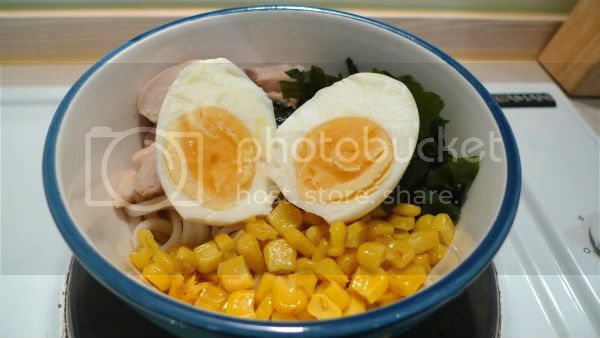 Top the ramen with the shredded chicken, wakame, egg and corn. Enjoy!